In spite of the United States’ renewed focus on great power competition in the 2018 National Defense Strategy (NDS), the war against terrorism will remain salient to US strategy. In few places is this clearer than in the Philippines. The United States’ ongoing efforts to bolster its military aid under the remit of counter-terrorism cooperation reflects Washington’s desire for continued influence in the region. Unfortunately for the United States, military aid to the Philippines without diplomatic and economic policies to match will not be sufficient to mitigate Chinese influence. In September 2017, the United States upgraded its Operation Pacific Eagle mission in the Philippines to an Overseas Contingency Operation (OCO) in recognition of the presence of the so-called Islamic State (IS) on the island of Mindanao. The details of the operation are scant — 200–300 US Special Forces personnel are currently serving in an advisory capacity, and US$20 million is committed to the reconstruction of Marawi. Although the United States deployed about double that number of operators during the height of Operation Enduring Freedom (OEF)-Philippines, the current deployment is a notable accomplishment given President Rodrigo Duterte’s desire to expel them from the country. Pacific Eagle’s designation as an OCO effectively removes caps on military and civilian spending in support of the operation, clearing the path for its budget to grow significantly. Burgeoning counter-terrorism funding is a tantalising incentive for Manila to cooperate closely with Washington, but it belies the fact that success for Pacific Eagle will not ‘come cheap’. A lasting peace in the Philippines remains out of reach as the Abu Sayyaf group has returned to the fore alongside other pro-IS militants. The Armed Forces of the Philippines (AFP) remain poorly trained and underequipped. Meanwhile, the Moro peace process continues to wither on the vine as the legislation negotiated to end the conflict awaits consideration in the Senate. Polling suggests that the Philippines is receptive to US military engagement and while Philippine confidence in US leadership remains strong, it is in decline. Similarly, the AFP remain stalwarts of the US–Philippine alliance — a situation that Duterte openly laments. The United States can feel justifiably confident in pursuing Pacific Eagle with the support of the Philippine military and the public, but it cannot count on the Philippine Congress. 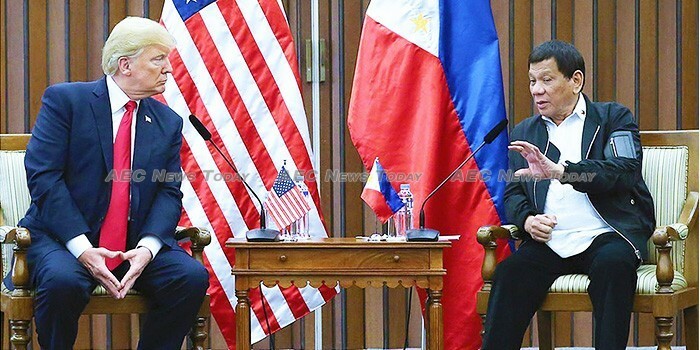 Presidential spokesperson Harry Roque Jr has repeatedly downplayed the significance of US–Philippine cooperation on counter-terrorism, while Duterte has gone as far as blaming Washington for masterminding a botched counter-terrorism operation. Even in pursuit of an ostensibly shared goal, President Duterte cannot be counted upon to do more than cynically embrace US–Philippine cooperation and begrudgingly accept US funds and supplies. 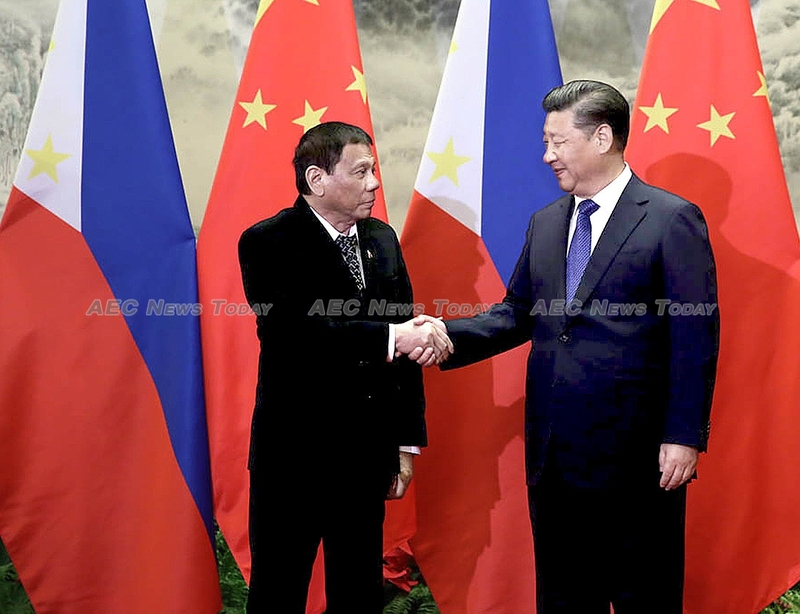 While the US seeks to preserve its relationship with the Philippines through military ties, China seeks to contest US influence by using trade, investment, and economic aid as an avenue to expanding security ties. Productive economic relations with both the United States and China are vital to the Philippines’ economic well-being, which makes it unlikely that trade and investment with one country will overshadow the other in the near term. As things currently stand, the United States dwarfs Chinese contributions to the Philippine economy in terms of both foreign direct investment and the value of remittances. According to the Philippines Statistics Authority (PSA), the top contributors of approved Foreign Direct Investment (FDI) to the Philippines in 2017 by percentage were Japan (30.3 per cent), Taiwan (10.3 per cent), Singapore (9.6 per cent), the Netherlands (9.1 per cent), and the United States (8.3 per cent). China contributed just 2.2 per cent. Even so, Beijing advances an economic policy that is more coherent and ambitious than anything put forward by Washington, especially since the latter withdrew from the Trans-Pacific Partnership (TPP). Until the United States manages to formulate an economic strategy for the Philippines, it will continue to rely on reinvigorating its security ties with Manila in order to offset China’s nascent efforts to expand its policies in that same area. As Duterte criticises and scapegoats the United States, he continues to seek greater security assistance from China. 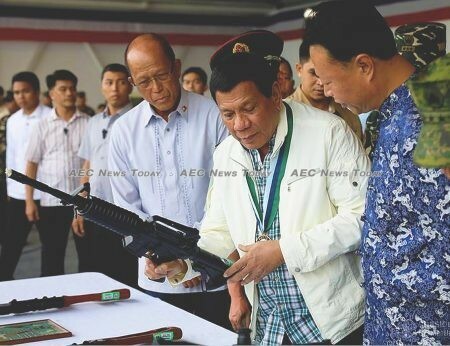 However, while the quality and quantity of Chinese military aid to the Philippines pales in comparison to US contributions, it has garnered the effusive gratitude of Duterte. In 2017, China provided approximately US$300 million in military aid and disaster assistance, marking the beginning of what Duterte heralded as ‘the dawn of a new era’. In December of the same year, Beijing and Manila completed talks to expand cooperation in these areas. By February 2018, President Duterte proposed sending his troops for counter-terrorism training in China as a means of ‘creating balance’. Meanwhile Duterte continues to play down the significance of enhanced Chinese military capabilities in the South China Sea, even as incidents’ such as the unilateral survey of Benham Rise by Chinese vessels stoke national anxieties over Philippine sovereignty. As the Duterte administration continues to engage in apologetics and paper tiger rhetoric to assuage the public’s anxieties over Beijing’s intentions, Washington must appreciate that its defence ties with the Philippines face a challenge. Pacific Eagle cannot hope to repair US–Philippines relations while keeping China at bay on its own. The United States needs to come to this realisation as it engages with its allies and potential partners in the region through weapons sales and military diplomacy. Ad hoc policies that rely on US defence capabilities and military aid are poor replacements for a long-term China’s increasing detente with the Philippines means time is rapidly running out for the US to firm up its relationship with the Philippines with a long-term foreign relations strategy . As President Donald Trump‘s administration enters its second year in office, it is running out of time to formulate one. This article was written by Luke Lischin, an academic assistant at the National War College. It first appeared on East Asia Forum under a Creative Commons License and is reproduced here with its permission.